Client relations are at the forefront of our practice. At Martin|Walton you are not a number. Our clients receive individualized attention. Your specific needs are our priority. Martin|Walton focuses on high caliber service for both business and individual clients. Martin|Walton is dedicated to representing clients with distinction and integrity. Martin|Walton is a Houston based law firm specializing in complex civil litigation. Our litigators have more than 50 years of combined experience and have handled lawsuits across the country from New York to California, both Federal and State Courts. The firm’s support staff is also very specialized with certifications in litigation support. Lead partner and former State Representative, Mike Martin, speaks on insurance reform with then Gov. Ann Richards watching. Public service has been a cornerstone of the firm’s history. 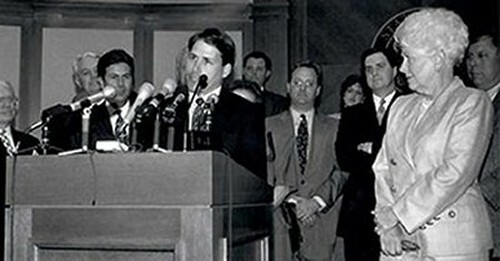 Mike Martin, licensed in 1986, served as a member of the Texas Legislature and passed landmark legislation in the areas of insurance and environmental law. Community service has also been a major part of the firm’s history. Both Martin and Walton have served on various non-profit boards with goals of protecting families and our environment. The firm’s dynamic history in public service illustrates the prevailing philosophy of its lawyers to be dedicated to serving our clients and protecting their interests. Get in touch with us to request your free consultation.